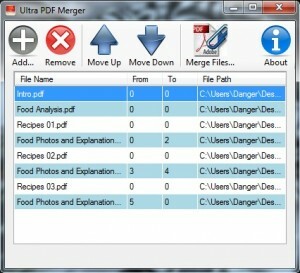 Ultra PDF Merger is a freeware PDF utility that joins your PDF files, or part of them, together. It is a windows application and it runs on both 32bit and 64bit systems. Ultra PDF Merger is portable which means you don’t have to install anything, just download it, extract its content and run it. In this way you can put it in your USB drive and use it anywhere. It runs on every system that has .NET Framework 4.0 including Windows 8. Add files: You can add the file(s) you want to merge using the Add button. You can select multiple files to add if they are in the same folder. Do not add locked or password protected files because merging will fail. You can also add the same file more than once. Remove files: Select the file you want to remove from the list and press the Remove button. Change file order: Select the file you want to move and move it by pressing the Move Up (Up arrow) or Move Down (Down arrow) buttons. Select specific pages to merge: If you want to merge specific pages from the file change the from and to numbers. If you leave 0 the program will ignore it. Select merge type: You can select either normal merge or chapter mode merging which will put each file to start from an odd page number by inserting an empty page if needed. Merge files: Press Merge Files… button to merge selected files. Merge files to first PDF: Press Merge to First button to merge selected files to the first PDF file. View program info: Press About button to view program info such as the version number. Added support for forms, now Ultra PDF Merger copies the form information to the merged file. There was an issue with rotation in some pages. Rotation of 180 and 270 degrees was not handled correctly. The rotation issue is fixed in this version. Thank you for the ones pointed out the issue, it was the first issue found and reported since Ultra PDF Merger was released! The changes of version 1.3.7 are mostly from requests from users. First of all, Ultra PDF Merger is now less sensitive when opening files since there were users that owned the files but files required owner password to open and application was blocking them from merging them. The responsibility of that is now moved to the users and not the application. A second option is added to merge, “Merge to First” now merges all the content to the first PDF file in the list. Don’t worry, if there is a failure it will not affect the original file, it is replaced only when the merging was successful. Also, some users open files from one location and save to another. The application was saving the last location of any action and the users had to navigate to the folders. In this version the application saves the last location of open and save operations separately. In version 1.3.5 there are several internal changes such as checks and validations. The most important feature is the “Chapter Mode” merge type. A new button added and by default it says Normal Merge, if you click it, it turns into Chapter mode and every document in the list starts from an odd page number. This is achieved by inserting an empty page when needed. Also, the icon of the application is changed in order to be modern. In version 1.3.2 there is a new button to clear file selection (remove all files). Drag and drop functionality is also added to this version. You can now drag the PDF files from explorer and drop them to Ultra PDF Merger for easier file selection. There are two changes in this version. The most important is that you can choose the pages you want to merge by choosing the starting and the ending page. The second change is that the check for two or more files has been removed. You now have the option to “merge” only one file. This screenshot of version 1.3.5 was taken in Windows 8 64bit. It shows all the buttons/features of Ultra PDF Merger. The following screenshot of version 1.3 was taken in Windows 7 environment and may differ in your system. Also the title bar has black and white because the background image is a tiger (from tiger and dragon). The download file is an archive file (.zip), extract its content and start merging. The download files of the previous versions are rar archive files (.rar) and you will need WinRAR or 7-Zip to extract their content. FindMySoft reviewed and rated Ultra PDF Merger with 5 out of 5. Visit them to read the review or watch the quick video they created. On windows XP, I cannot select more than one file in the application. It will be fine to be able to remove all the files with one click. Hi bob, Ultra PDF Merger allows you to select only one file at a time, under all operating systems. Yes, multiple selection could make deletion easier but limitation was added due to file ordering. I will add the option to remove all files to the next version. For now you can close and reopen the application. I would love to be able to drag and drop files to be merged. Will that come in future versions? It sounds very useful. I will add this functionality to the next version. The next version of Ultra PDF Merger will be released within the next two weeks. Users will be able to add files with drag’n’drop. Also there will be a button that clears all the files and you will not have to delete them one at a time or reopen Ultra PDF Merger. Ultra PDF Merger 1.3.2 is out! Read above for what is new in version 1.3.2. If you have any requests leave a comment. Sincere thanks for a stunning product Michalis. For some reason our PDFs are being merged upside down with version 1.3.2… Any idea why? Ultra PDF Merger takes all options from the original PDF. Version 1.3.2 did not change the way it merges PDF files. Provide me a link with your file and I can check it. finally I uninstalled adobe acrobat from my laps… really liked your product …great software …small size and easy to use…thanx for such a software michalis… wish you a very good and healthy life ahead .. regards ..Sukarma Nepali … from the land of Buddha and Mt. Everest. What is up with the virus warnings? They are false positives. I obfuscate the source code (using Confuser) and those antiviruses are confused because they don’t find the pattern they are looking for. Not feeling good about the virus warnings.. but ok.
Why not go open source if the program is free? Who does?! But outdated (or bad) engines and algorithms are giving false positives. There are two very different things. I wanted to give it for free but I didn’t want to share the code. Now, I started to thinking about it again, I am planning to change the entire interface to a new technology and maybe make it open source. Hello Michalis . . .
First of all thank you so much for developing this software. I am a retired person who is putting some stories that I have written over the years into a flip-page binding software with sound . . . and needed to bind my PDF files . . . and then I saw this software. HOWEVER, I have gone through all the steps; i.e., have the software on my desktop, unzipped the file, added all the files I want for this project; but when I click MERGE FILES it brings open my DOCUMENT FILE window . . . so as to have me put a name of the file down . . . and after I type the name of the file and click SAVE . . . bango . . . an immediate little window comes up saying, “AN ERROR OCCURRED WHILE MERGING THE FILES.” Any suggestions as to what I am doing wrong? I am sure that I have the .NET framework because I re-installed it. Hello . . . RISH again . . . I was just thinking; for people like me (64 and an X-blonde), it would be SUPER if you included in your software a HELP menu that included “THE STEPS TO TAKE TO HAVE UltaPDF MERGER WORK.” When I used it I was thrilled because it loaded my PDF’s as I chose them, one at a time. But, once it gave me the error message, “An error occurred while merging the files,” I didn’t know what to do next. I first checked to make sure that all the files I loaded were PDF . . . and they were . . . then I made sure that I had the NET file, and I do; so, now . . . anxious to move forward in my project, I knew nothing else to do but send you an email and ponder on what I could have done wrong . . . while I wait for your reply. March 5th, 2014; Wednesday: 2:57 p.m.
Hi Rish, it is not .NET problem. If the framework is missing, the software doesn’t start at all. It seems that one (or more) of your PDF files is used by another program or it is protected. I will add the help button on the next version, so far ‘About’ was redirecting to this page. Future version will indicate the locked and password protected files after loading. I have downloaded the last file(Ultra PDF Merger v1.3.5 ). What can I do?Could you help me? Hi Cristine, if files are fine make sure they are not used by other software. For example, if you open a PDF in Windows 8 you have to specifically close it or else it stays open and other programs can’t use it. Also, make sure you didn’t delete itextsharp.dll and it is in the same folder with Ultra PDF Merger. I would like to thank you for your program. It is a very useful, light and very easy to use program. your Ultra PDF Merger is fantastic. I would like to ask, if you are developing this app yet? 3) sometimes, there is a rule for naming final pdf file. I am using name of first merged file … so some mask game (name of first file, last file, include, exclude, name of parrent directory, auto increasing counter? Thank you. I like your ideas and I will integrate (most of) them in the next versions. I don’t have much free time so it will take some time. I hope in two months to be able to release the new version. It took longer but the new version (1.3.7) is now available! Thanks for the great software! The only thing that doesn’t seem to be working for us is that it doesn’t seem to retain form information once we merge. Is there a way I can send you a couple of sample files to show you what I’m talking about? I love this software it has been a great help! I noticed when i merge pdfs with bookmarks in them it erases them. Is there a way to prevent this from happening? Hi, I am glad you find Ultra PDF Merger helpful. Send me a sample file with bookmarks, I’ve already sent you an email. Can you explain what’s going on? Hi Andrew, there are only two reasons, either the site was hacked and the files were altered or false positives. I downloaded and checked the files and they are the original, with the same CRC. This leaves the false positives, there were some also in the past. Maybe there was an update on one of the antivirus scanners and it recognizes it as a malware. Antivirus scanners are doing a great job but they are not perfect. Thank you for developing and generously sharing such a simple and useful tool. Do you consider any possibility of allowing the dll file to be installed or something like that (like, e. g., moving it to the c:\windows\system32 folder) instead of keeping it in the same folder of Ultra PDF Merger ? I mean… is there any way to just indicate to Ultra PDF Merger where to find the dll file ? Thank you again. Greetings from Brazil ! You are welcome, I am glad you like it. That is not hard to implement so I will consider creating a minor version for this. In the meantime, consider creating a shortcut pointing to the executable. I figured out this very simple solution just a day after I wrote you. I created the shortcut, but also indicating in which folder should the executable run. And it works just fine. I guess it wasn’t a good idea of mine. Don’t waste your time on it ! Maybe you could just give this tip in the next version. There is no need to write any code for this. Thank you again. More greetings from Brazil!